Be sure to check out the gallery from Daph’s most recent appearance at Gallifrey One, or poke through her blog to check out her behind the scenes thoughts from the event. In the 1996 Doctor Who Movie Daphne played the role of Doctor Grace Holloway. Her strong portrayal as Grace was favorably received by fans and the chemistry between her and star Paul McGann was touted as one the best in the show’s history. There was some controversy, as she was the first character to romantically kiss the Doctor. Prior to this he had been portrayed as a relatively asexual character, and the story of The Eighth Doctor & Grace set a precedent for the more sexually charged nature of the new Doctor Who series that began in 2005. In 2004, Ashbrook toured the United Kindgom, clips and home movies of which were later released as a DVD entitled Daphne Ashbrook In The UK. This documentary centered on her involvement with Doctor Who and the people who are a part of it. The trip also involved her working on one of the Doctor Who audio dramas, where she performed in the Big Finish Productions audio play The Next Life opposite Paul McGann as the Eighth Doctor… this time as a different character named “Perfection.” This was the first time the two stars had worked together again since the 1996 television movie. She has been featured at Doctor Who and fan events both in the UK and US, and has recently taken to blogging her experiences and adventures in those travels along the way. In 2011 Big Finish Productions released Tales from the Vault featuring Daphne and Doctor Who: The Movie co star Yee Jee Tso, along with other former companions Mary Tamm, Katy Manning, Peter Purves and Wendy Padbury . Tales from the Vault 2 is in the works. On the web she has been featured in extensive interviews on the Doctor Who podcasts “Doctor Who: DWO Whocast“, “Doctor Who Podshock” and “The Happiness Patrol“, among others. In 2010 Daphne released a DVD of in depth interviews that took place over the course of a year of travel spanning everywhere from Alaska to the UK. 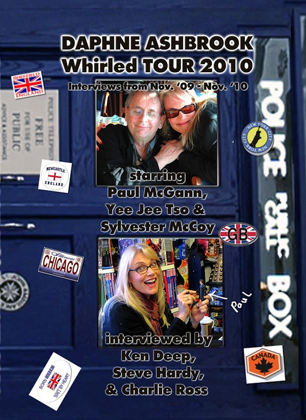 Daphne Ashbrook Whirled Tour 2010 also features Paul McGann, Sylvester McCoy, Yee Jee Tso and others. The music video “One Big Love” is premiered, featuring footage from the Alaska Doctor Who Sci Fi Sea Cruise. 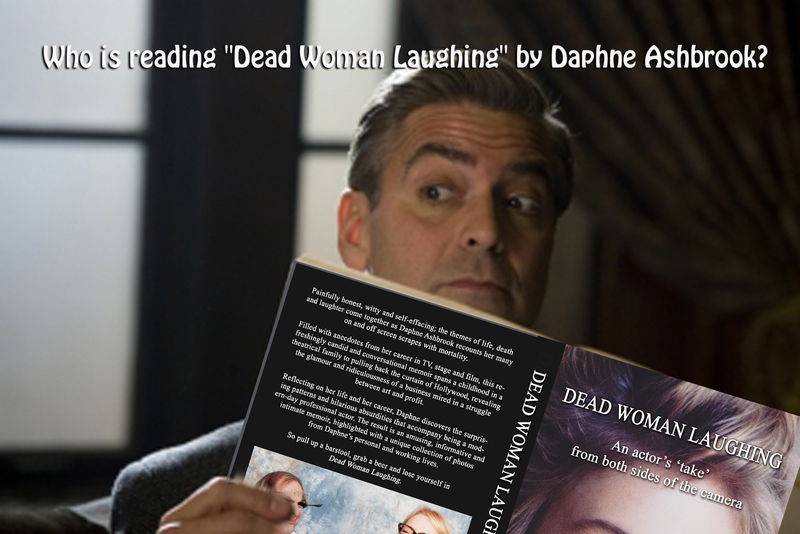 Who is Reading “Dead Woman Laughing” by Daphne Ashbrook? Comments Off on Who is Reading “Dead Woman Laughing” by Daphne Ashbrook?